I'm torn between numbers 2 and 3. I actually like both the neckline and hem on 1, but the dress is a little unflattering. Number 3 is a little more your usual style, I think, but 2 has nice accents in the skirt portion. My vote is for 2, , 1 in that order. I dont like the neckline in 1 and 3 might look odd if your shoulders are wide. Besides, I think you can wear better jewely with #2. I like number 2. I think it's the right length for you and I thnk that the fuller skirt will flatter you more. #2 definitely. Solid colors are just too boring. 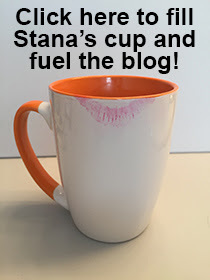 Hi Stana from Lena 'Down Under'. No 2 I reckon would be the best; No 1 cowl neckline, especially large, can be a nuisance. No 3 neckline can make the shoulders look wider than they really are, especially on us "femulated". Oh, 3 is definitely the best...and 1 is a close second. I don't think the sleeves and neckline on 2 do anything for you. No. 1 is my favorite. 2 votes for #2 in this house. I'd say #1. Love the tulip bottom, draws attention to your lovely legs. My favorite is number 2 as I think the style would be very flattering. 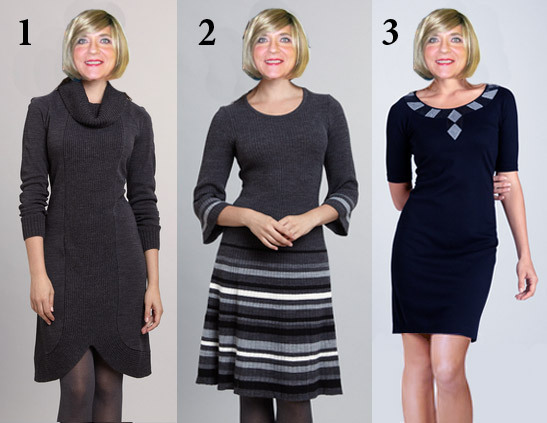 I also like number 1 because I like that style of neckline. So my choice is 3, 1, 2, 3 is the nicest on you! 3! 1 & 2 are a bit frumpy! I'd go with number 1. To me, the bell cuffs and horizontally striped skirt of number 2 looks quite dated, and number 3 looks like office attire. 3 and 1, yes, 2 not so much in my view. 3 especially. Great length for great legs, a neckline that will have a slendering effect on your torso and a fine color for your fair complexion. I really think that # 2 has too much fullness in the skirt, and that the horizontal striping only emphasizes the effect. I like 1, but why not buy all three: 1. for the office, 2 for daywear and 3 for party nights. I think the flared skirt with horizontal stripes on the #2 pic / dress would look great for you and complimenting your figure. I am really going to help here, you will look great in any one of them. However, I think #3 will show off your legs and figure best. Hope that helps and thanks for always femulating. 3 is a classic Stana look. But to ring the changes, vote goes to 2. I like #2 the best for you followed by #3. No real problems with #1. You have good taste. I like #2 and then #1. I think the longer length is better for you (and I don't mean an age thing--the longer length just looks better on you). I like 2 and 3 the best. I like 3 just a teeny bit better. Liking #2. Love the drape and swing of a flared skirt. I think #1 is not flattering on you, and the hemline is a little 'young'. It would be great to have some context for your choices/decisions... i.e. I like 2 best. The stripes are just right! I'd go with 1 but they all look great!